MOSCOW, Russia -- A government television channel dubbed Vladimir Putin’s latest state of the nation address “A Message from Above”. Dmitry Kiselev, Putin’s chief propagandist, even likened it to speeches by Roosevelt, Churchill and De Gaulle. Putin’s sermon had both messianic and defensive overtones. He called Crimea a sacred place, rather like the Temple Mount in Jerusalem. In fact, remarkably few Russians are even aware of Vladimir’s baptism in Crimea. For them the peninsula is linked to hedonism rather than spirituality. It was a place for holidays, summer romances, state sanatoriums and dachas. It is also at the heart of Russia’s post-imperial nostalgia, and it was to this that Putin was appealing. Soviet ideology proclaimed a Utopian future; modern Russian ideology focuses on the past. But the key ingredient of confrontation with America remains the same. In his speech Putin cast it as part of an existential struggle for Russia’s survival as a sovereign state, likening the West to Hitler who “set out to destroy Russia and push us back beyond the Urals”. He blamed the West for supporting Chechen insurgents who launched an attack on Grozny on the eve of his speech. Russia, in this narrative, is not an aggressor but a victim and defender of its interests and values against America, which staged a coup in Ukraine in hopes of placing missile defences there. Had Russia not moved into Crimea, it would have become a military base for America. The main reason why people believe propaganda is because it resonates with their own feelings. As Mikhail Yampolsky, a cultural historian, argues, the dominant feeling, exploited and fuelled by the Kremlin, is of resentment: a sense of jealousy and hostility. People who are deprived of any say in their own fate turn their resentment on an imagined enemy, be it Ukrainian “fascists” or American imperialists. Yet, just as with Soviet propaganda, which blamed outside enemies for the country’s failures, resentment is vulnerable to reality. When television pictures contradict people’s personal experience, they stop working. “You can’t really ‘sell’ anything to people, that they don’t wish to buy,” says one television boss. 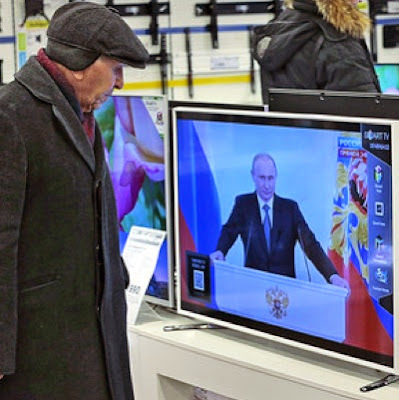 As the ratings show, Russians are tiring of news about Western aggression. “People now want to watch melodramas and fairy tales,” says the TV boss. What most Russians really need is news about the unfolding economic crisis that Putin’s message from above largely ignored. The continuing fall in the rouble, eroding living standards and a sharp rise in food prices are worrying people far more than the fate of separatists in Ukraine. Now that sanctions are starting to bite, enthusiasm for war and isolation is diminishing fast. “Cognitive consonance between propaganda and people’s self-feel does not withstand external shocks,” says Mikhail Dmitriev, head of New Economic Growth, a think-tank. Over the past nine months opinion polls find that support for the presence of Russian troops in Ukraine have fallen from 74% to 23%. Many who dismissed Western sanctions as irrelevant now fret over Russia’s isolation. “The sanctions are working,” says Lev Gudkov, head of the Levada Centre, an independent pollster. The consumers who have emerged in Russia’s big cities in the past decade are “not prepared to tighten their belts,” he adds. This does not mean that such people are prepared to sacrifice their consumption for civic freedoms, either. Despite growing anxiety about living standards, Putin’s popularity rating remains at record levels. Yet, as the street protests in 2011 showed, this could change quickly. Polls show that the overall view of the state as corrupt and uninterested in the people remains as strong as ever. Putin is aware of the dangers. To sustain his position, he needs the West to start lifting sanctions so as to induce more economic growth in Russia, but he also has to keep up the appearance of an enemy both within and outside. To achieve this Putin might yet surrender the east of Ukraine while keeping Crimea. Novorossiya, an historic term that Putin invoked to justify Russia’s intervention in south-east Ukraine, was notably absent from his state of the nation speech. He is also hoping that he can entice businesses to invest more in Russia without any political liberalisation. Less than a week after his speech, in which Putin proclaimed “freedom” as a necessary condition for the country’s growth, Russian civil institutions came under renewed pressure. The Moscow School of Civic Education, one of Russia’s oldest NGOs, which campaigns for the rule of law, was added to the list of foreign agents. Memorial, a noted human-rights group, is under threat. And Andrei Sakharov’s centre is being harassed. Yet while this will further undermine civil society, it is unlikely to compensate most Russians for their declining incomes. So far, it seems, Putin’s preferred method of dealing with Russia’s crisis is to talk the country out of it. His message from above was meant to persuade the people and the elite that nothing terrible is happening and that Russia can weather both the West’s sanctions and falling oil prices. Yet Putin looked tired and anxious, betraying a lack of confidence. “Yes,” Putin answered confidently at the time. Thank you Nick for your hard work and good assessment of situation in Russia. I am behind every word in this article. Thanks again for the honest work.